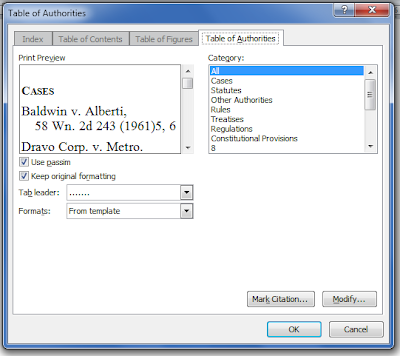 Setting up your brief so that Word will automatically create and update your table of authorities is a fair bit more on the technical side than my last post about using auto-correct to quickly create your citations. As a result, this post does not come along with any similar public shaming for not following the instructions. (Trust me, I'm just as sad to not be writing it as you are to not be reading it.) Many people prefer to not get too into the technical side of their software. In most circumstances, I tend to be the same way. So I begin with a much more gentle push for why you should consider following my instructions. In my experience, drafting a table of authorities after the brief is otherwise done is a tedious and frustrating process. 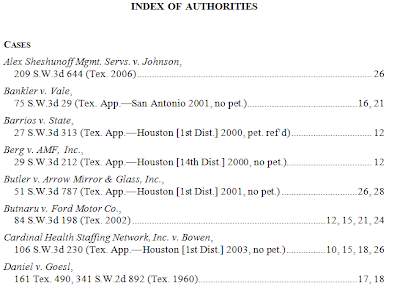 While there is a fair bit more labor involved in setting up your brief so that it will automatically create and update your table of authorities, in my opinion, it saves time in the long run. It also gave me a greater sense of confidence that my table of authorities was as close to perfect as I could get it. That's rather vague, I know. It typically makes more sense to convince people that they should go through a process before actually explaining the process. Here, however, most of the explanation of why it is a worthwhile process will make more sense if I explain the process first. For those that are anxious, scroll down to the bullet list at the end. For the more patient, please at least gloss over the explanation of what you need to do to create a table of authorities. Hopefully, that will make the explanation of the benefits make more sense. If you prefer keyboard shortcuts, press Alt+Shift+I (all together). 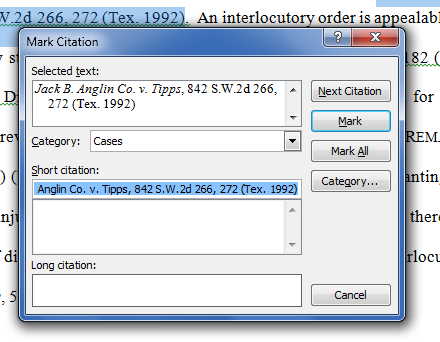 If you prefer to use the menu ribbon at the top, select "References" and then click on "Mark Citation." There are two things you need to do. First, make sure "Category" is correct. Here, it is. Other options are Statutes, Other Authorities, Rules, Treatises, Regulations, and Constitutional Provisions. You will notice on the right, there is a button that allows you to add other categories. You can also use this to change the order in which those categories appear (on the list and in your table of contents). Before doing anything like this, please read my caution below. 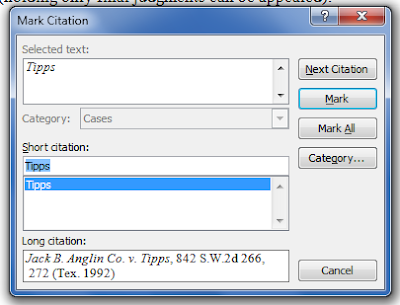 Second, type in a short citation name. This can be anything you like. The short citation is there only for internal purposes. No one else will see what the short citation is. That said, if your short citation in this pop-up matches up with the actual short cite (a portion or all of it) that you use later in the brief, that can help make marking other citations later on easier. Congratulations! You've marked your first citation. Unfortunately, you're not quite done with it (if it's a case cite). Go ahead and close the pop-up. One thing you might notice is that your text looks a little unusual. 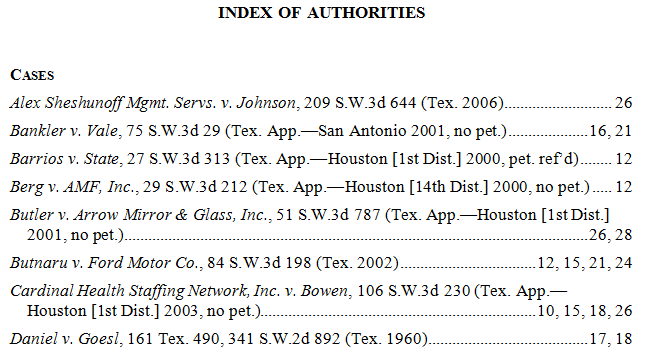 The text in between the curly brackets is the information Word uses to create the table of authorities. 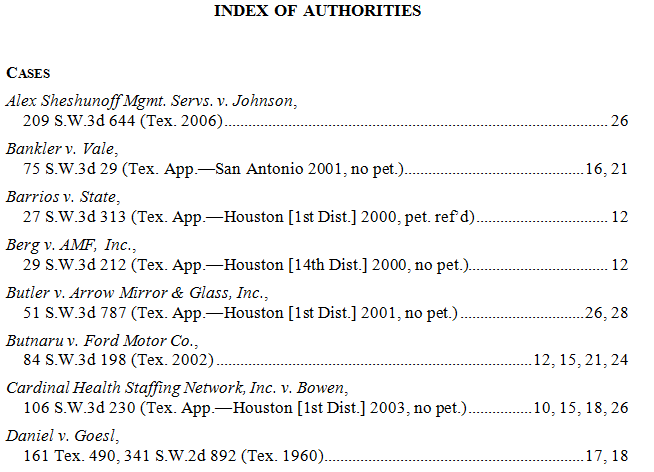 For case citations, the table of authorities should not include a pinpoint cite. So you will need to delete that from the text between the curly brackets. While you can make other edits to the text between the curly brackets, I would urge extreme caution in doing so. Unless you are very familiar with the different segments of this text, you can end up creating errors for your table of authorities. You're now ready to mark your next citation. If you want the dots and paragraph symbols to go away, go to your Home ribbon, and click on the paragraph symbol. This is the short citation cite. It's what tells Word that one citation refers back to an earlier citation. You will use this for your Id. citations as well. Now you go through and mark every legal citation. As I said, this is labor intensive. But the end result is a table of authorities that always updates every time you make an edit. So let's turn to making a table of authorities. Go to the page you want, and put the cursor where the table of authorities should begin. If it's not currently selected, click on the Reference ribbon at the top of Word. You will see an option for "Insert Table of Authorities." Admit it. You have table of authorities envy. Now let's say you make any amount of changes to your brief. It could be a little. It could be a lot. Now you want to update your table of authorities. Click anywhere in your table of authorities, and press F9 (at the top of your keyboard, not far from the actual 9 key). Voila! Automatic update! You're welcome. You'll notice that when you press F9, you loose all those Shift+Enter changes you made (any any others). That's why you want to wait until the very end to make those formatting changes. But now, you can do any amount of editing and your citations will be right there with you. 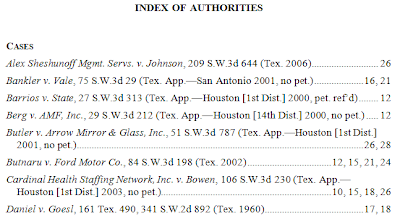 It's worth noting that if you have multiple sections in your table of authorities (such as a section for cases, a section for statutes, a section for rules of procedure, etc. ), you will need to click on each section and press F9 to update. You can pretty easily mark your citations as you go along. So the labor isn't too intensive. If you inadvertently type in a short cite without an earlier long cite, you'll know, because you won't find the reference in the citation marking pop-up. If you're doing edits and find yourself with an Id. 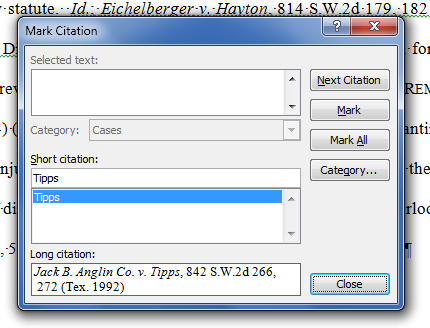 that doesn't match up to the earlier cite, you can find out what it's meant to refer to if you display the citation marks in the text. This is the most important one: If you're finishing your brief on a rapid deadline, you know your table of authorities will be ready almost at the moment you're done with editing. It may not sound like much, but a table of authorities can be a pain to put together, especially at the end of a tight deadline. If you're on the fence about whether you want to go through this process, try it once. If you don't like it the first time, the next time probably won't be any better. But if you do like it, I believe you will save yourself a lot of time and worry in the long run. Next column: Using styles in Word. This will be my last how-to for Word for a while. But I promise there will be a LOT more public shaming in it.